We use routing almost everyday. In the car, the GPS is our best friend. In public transportation we use the topological maps to find the quickest connections between point A and point B. Our mental maps allow us to get around traffic jam at known places. For GPS especially, a lot of work is done upstream by engineers to make it possible to guide you through a city you do not know. Data has been collected, prepared and used in applications running on devices we call “GPS”, and which is almost mandatory to have in the car. With our today’s device, live traffic data are added into the algorithms to find the quickest (shortest? fastest?) route at any time of the day. What about digging into this process and build our own routing application with (just) a small example? In this article, we focus on the development of a routing web application that gives the fastest route between two points the user chooses. Our city lab this time is Brisbane, QLD, and the web app we’re going to create looks like this (see hereunder). Unfortunately, I do not have yet a public server where I could share my apps, so you have to get fine with only screenshots, *sorry*. Using exclusively OpenSource data and products (except the host’s OS which is Windows 10 of course), the architecture we’ll built in this article looks like this. Quick note: this article was inspired from the pgrouting workshop and can be followed by rookies as well as by a more advanced users. My main development machine is a Windows 10. I do however prefer delegate all the server jobs to a dedicated server. That’s why I make use of another server, ubuntu, I run in a VM. If you do already have a working ubuntu environment, you can skip this step. My VL is a ubuntu Desktop. Everything is anyway done via command line despite the “Desktop”. Get ubuntu desktop for here. Get Oracle VirtualBox from here. Launch the Oracle VirtualBox and create a Ubuntu VM. Right-click on the created VM > Settings > Storage and choose the iso file. Congrats! Now start your server and follow the configuration steps of ubuntu. NB: For convenience, it is better to set a static ip address to the server. The default dhcp configuration gives a random ip address each time you will connect. Follow the instructions here to set a static ip. The static ip I defined is 192.168.1.87. 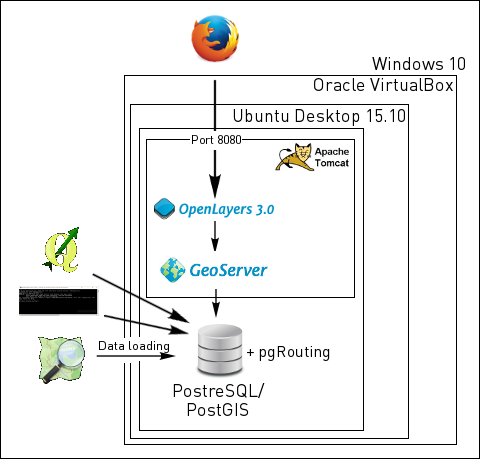 PostgreSQL is a free and Open Source database that can handle GIS data with its PostGIS cartridge. pgRouting is an extension of PostGIS allowing to do routing calculations. We need it too! Install also the client tools on the host, which is Windows 10 here. You probably want to add the C:\Program Files (x86)\PostGIS_bundle\bin directory to the environment variable. That makes it later possible to access the tools directly in the command line. In Windows and in the command line, connect to the database instance via psql (the password was asked during the installation process). Create the role themagiscian. We limit this role to only create databases, tables, and login (no superuser). The postgis and pgrouting extensions have to be activated. As only superusers can, you may have to log out and login with the postgres user to activate the extensions. The data we use come from OpenStreetMap. As Brisbane is a big city with a wide urban spread, the amount of data we need is quite huge for our routing. Using the OpenStreetMap website is not suitable for this. overpass-turbo.eu is more in our scope as it’s better for the download of larger datasets. Please have a look at this article to know which tool to use for download depending on the size of the exepected data. Paste in following query to get all the streets suitable for a car. Ways for horses, bicycles, pedestrians can be the subject of another article. The language used here is a specifically crafted query language and the highway keys used were taken from here. The way I decided to load the data was via the shp2pgsql tool. 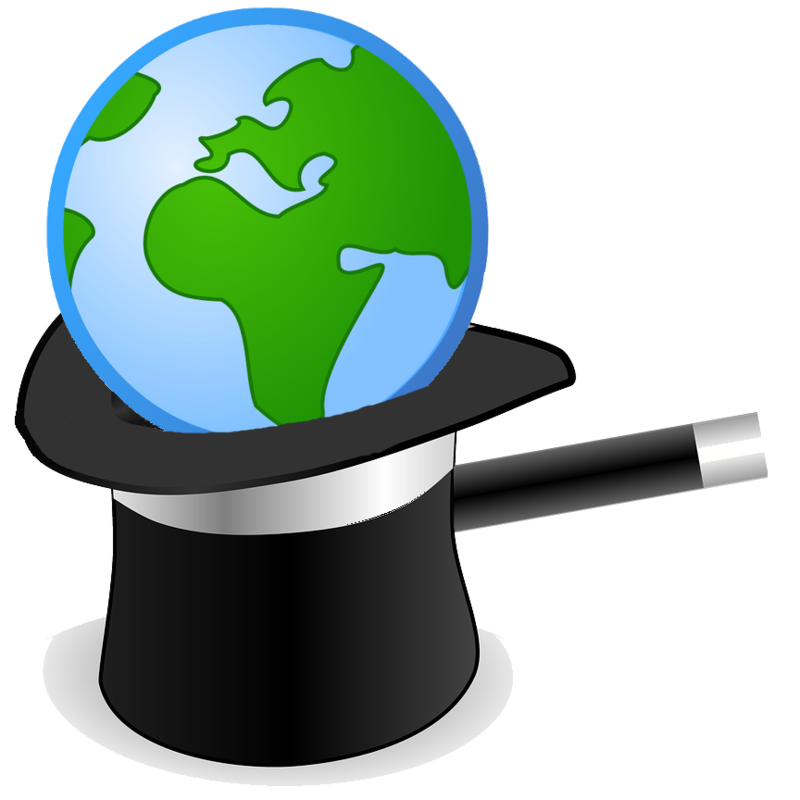 Note that there are many other ways to load osm data into PostGIS (osm2pgsql for instance). The data has however to be converted from the raw osm format, to shapefile. I used QGIS for this task. 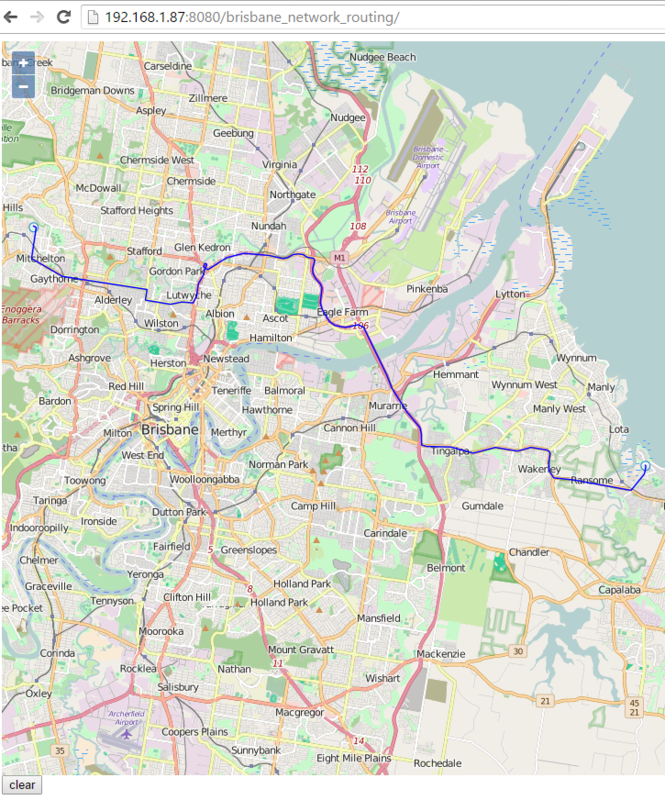 I call the file BRISBANE_ROADS_OSM.shp and I reference it in the shp2pgsql script hereunder. Have a look at this page to get the meaning of all the parameters. NB: The -S parameters is very important as it generates simple geometries. We absolutely need that for our routing algorithm. NB2: The name of the imported table is network2clean. Following steps will go through a cleaning process and finally we will give the proper name “network” to the table. The important data are still “raw”. That means, they contain all the attributes and attribute values coming from OpenStreetMap contributors. There is about 130 columns in the data and we have to clean it a little bit up. First, we merge different columns referring to the same attribute. There are lots of columns we do not need in our routing application for cars. For example, the columns about railways, the name of the contributor, bus_lanes, etc. We simply drop these columns up. Here comes the tough part. The lines we are handling are not well split although we need them to be so. In other words, start points and end point of lines do not currently coincide. Our algorithm needs that to perform routing. We could simply execute a ‘split at intersection’ command but we have to take care not to split, for example, tunnels, bridges, or motorways. The tables that will welcome the nodes has first to be created. Start and end points of each single line is loaded into this table. Lines have to be split except if they are highways, identified by “motorway”, highway links, bridges or tunnels. The intersection between lines can be a line, a multiline, a point or a multipoint. We’re only interested in points and multipoints we have to explode to only keep the individuals. Delete all the geometries which are not points. Create an index and a unique id. We make sure there are no duplicated point. There is already the ST_split function available in PostGIS. It however cannot handle multisplit. In other words, using ST_split would result in a lot of duplicated geometries. The function we define here should only keep the split lines. I found on the web such a function and I adapted it. The last thing to do in this network creation is to … create the network! Here we make use of the newly created ST_MultiSplit function just here above. Each line is split by the intersection points. We almost double the total amount of rows in the table during this process. NB: The name of the table is changed here (from network2clean to network). Not all streets and roads have a value for the speedlimit attribute. We do however need all rows to be filled for the routing purpose as we have to calculate the time it takes to cross every single street. We continue our network cleaning process here. The speedlimit colum is populated here. With maxspeed and the length of each segment, we extract the time it takes to travel each line. VERY IMPORTANT: we need to take into account oneway streets! Some of the streets have their ‘oneway’ fields filled with a value, but this is not the case for all the rows. Basically, we fill the column ‘oneway’ with a ‘n’ for no where the field is not already set to yes. Additionnaly, motorway, motorway links and roundabouts are also set to oneway. This is essential for routing. Sometimes, we need to know what is the maximum height allowed on a street. We noticed some discrepancy with the data. We fix that here. All lanes are put to 1 when it is not indicated the opposite. We set the attribut “bridge” to “No” when nothing is already specified. So we do as well for the horse field (even if we do not need this field in this article as we’re dealing with car routing). We create a new unique id as the previously used id, gid, was duplicated during the MultiSplit process. As we do allow routing along streets in both directions, we have to define a reverse cost. Sometimes, the travel time is different in both directions. For one-way streets, we put the reverse cost to 99999 minutes to be sure our algorithm does never lead the car there. The topology creates a network of interconnected lines by points. For each line, we must specify the start and the end point, which are the vertices. The output table can then be ‘routed’ in the algorithm. The algorithm we use is naturally Dijkstra. This algorithm is available as we did import the pgRouting capabilities. This function is put inside a wrapper for the function to be easier to use. The procedure is described here, but the function is adapted to match our needs. The function takes in input the network table and the coordinates of the start and end point. The function then chooses the nearest vertice it finds and calculate the shortest path with the Dijkstra algorithm. Execute this script in pgsql. The function can be tested with following command. Please see the result by adding this layer TESTROUTING into QGIS. The server side is composed of an application server, Tomcat 8 here, and Geoserver for serving the network data. Geoserver can be downloaded as a war and deployed in Tomcat. Just drop this war file into Tomcat’s webapps folder /var/lib/tomcat8/webapps. You probably have to run following query to make it possible for external clients to access the port 8080, Tomcat’s default port number. Log in with the default credentials admin/geoserver. Be sure all the other parameters are set like this. Congratulations! The routing server is now ready to welcome the requests coming from our OpenLayers client! You should get the result of the GetCapabilities request. The website makes it possible for the user to pick a starting and an end point. The application calculates then the fastest path between these two points. As we’re (trying to) doing things properly, we will create three files: html, js, and css. 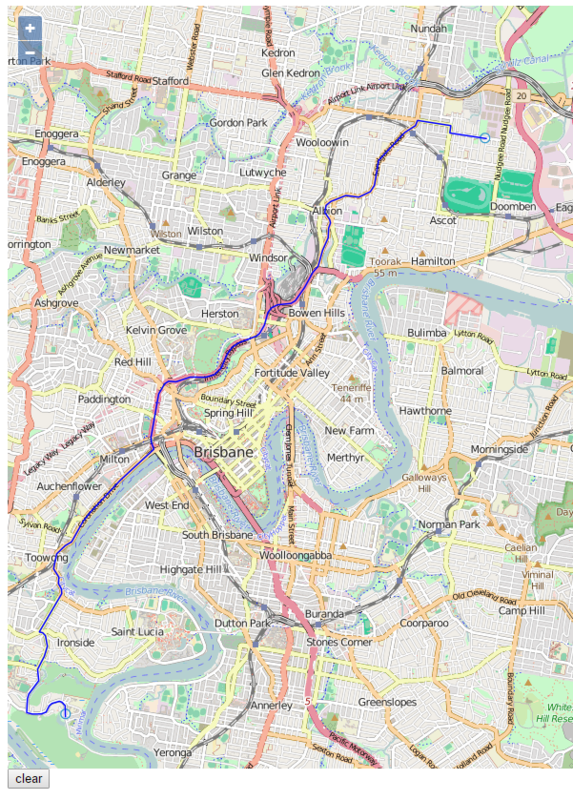 Create a new folder in geoserver’s webapps folder and call it “brisbane_network_routing”. The following three files (html, js and css) have to be deployed there. This is the skeleton of our website. It is composed of a map and a button to clear the shortest path that was just drawn. We import the styles ol.css, the OpenLayers library and the bnr.js file, which takes care of the actions done when using the web app. 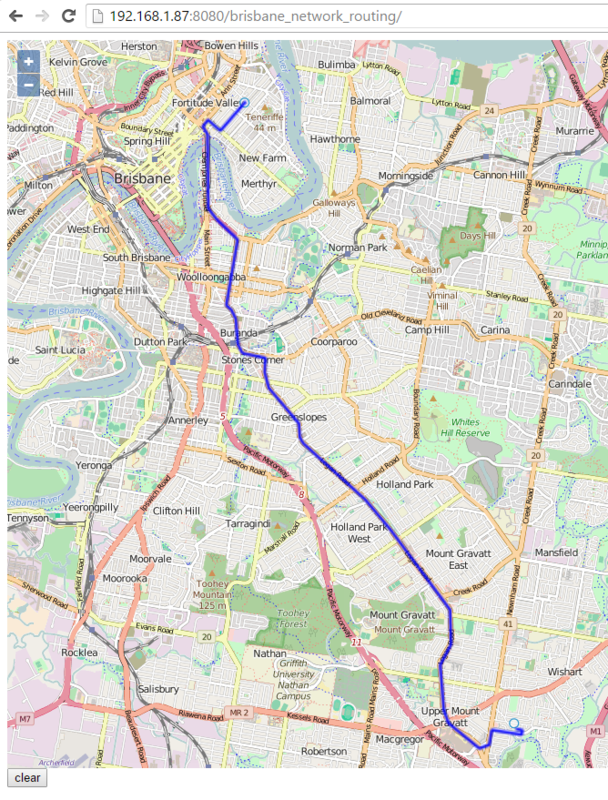 Bnr stands for Brisbane Network Routing. The map object is responsible for the map. Its default location is in Brisbane’s CBD 17035589.221, -3179098.060 . We add controls such as zoom in/zoom out. The second part of the file takes care of the user’s actions. It creates a point feature where the user clicks. The most important part is probably the call to the server for the calculation of the itinirery (http://192.168.1.87:8080/geoserver/Brisbane_network_routing/wms). The last part of the file is about the cleaning of the map. Once an itinirery is calculated, it can be cleaned for another calculation. // The "start" and "destination" features. // The vector layer used to display the "start" and "destination" features. // Register a map click listener. // to the server projection (EPSG:4326). // Reset the "start" and "destination" features. // Remove the result layer. As stated before, I do not have a public server where I could share the whole application. How did you discover our world with Google Earth? Why didn’t you use osm2pgrouting to import the OpenStreetMap data? It does all the way splitting and a bunch of other tweaks to the data, so all the manual import using SHP files is not necessary. Using osm2pgrouting is much more easier and faster, that’s right, and I consider posting an updated article using this tool. The first philosophy of my article was to dig deep into data processing and to show in detail all the mechanics and aspects you should take into consideration when preparing data for a routing purpose. osm2pgrouting does all this stuff quite “naturally”, for not saying “transparently”. For my pedagogic oriented technical blog, I thought the first option was more suitable. But let’s be productive and use osm2pgrouting! New article is coming! I understand that osm2pgrouting is sort of a “blackbox”. However, the reason why I wanted to mention it, is, that – as you wrote in your post – OSM does not provide the correct network topology when you import data with osm2pgsql for example. You need to create nodes at intersections sometimes, but not every crossing linestring is an intersection. osm2pgrouting should help to have a correct network topology. I’m pretty sure there are cases, that osm2pgrouting doesn’t handle yet either. Nevertheless the result is probably better than trying it for the first time manually.